For step by step wiring instructions with detailed photos and a video, read our SG wiring guide. 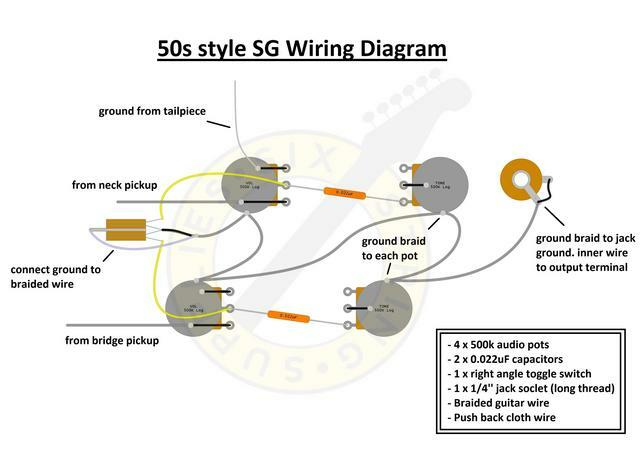 Wiring diagram for our Gibson SG wiring kit - This based on the popular "50s" style wiring and uses braided wire from the toggle switch to ground all four pots together before continuing to the output jack. The setup is essentially the same as Les Paul wiring ie. two humbuckers, two volume and two tone controls, with the exception of using a right angle toggle switch instead of the standard Switchcraft 3-way toggle. Read our Switchcraft 3 way toggle wiring guide for more information on how to do this. You can of course use the short frame toggle switch instead of the right angle version due to its compact size. It is the same principle whether it is a right angle switch or a straight frame switch.